Roll kuchen are so good..with watermelon and Roger's syrup of course. Your recipe is just a tad different than mine..wondering how many variations there are..
mmmm....ya I agree.My grandma gave us grandkids this special treat as a meal in the summer. My Oma made them just the way you have with the slit and twist. However, my Mom who is an excellent plain cook, always makes slanted rectangles. I have made them both ways.My kids loved the occasional big puffy one so they could see the hole when they bit into them.My husband, who does not eat watermelon, loves rollkuchen with rogers syrup. I too do not care for watermelon; but love the Roll kuchen. I like them with rhubarb or gooseberry jam. Picture perfect one again . .. These remind me of sunday after church Borscht with rollkuchen (as a child),summer, family get togethers . . . I love them with jam! My Grandmother called these Fat Mans Buckles.My Dad can eat these till he bursts. I have a watermelon in the fridge...but I can't break into it until the rollkuchen have been made. They look most yummy! Your recipe looks just like my mom made.She said it had to be whipped cream not milk or half cream!! !They are the best,plan to make them next week when we go camping! !With watermelon OF COURSE!!! Mmmmm, nothin' better than watermelon and rollkuchen on a hot summer day!! Our former pastor and his wife were out for a visit this weekend and she asked me if I was familiar with this site ~ you know, being a Mennonite and all. I wasn't, but I am now! And let me just tell you, I. AM. IN. LOVE!!!! I followed your recipe, which is also the same as the one my friend used. I had only had rollkuchen twice before, at her place (complete with the watermelon) & it was so yummy! I decided to try it with my family...can't say it was a huge hit with them, but they tend to be really picky with their food. My nephew thought the "dough" (as he called it) was pretty good. Since our watermelon wasn't the greatest, we made almond whipped cream to go with it...Not too bad. But it wasn't as good as my friends rollkuchen. Maybe you need to grow up on it to be able to cook it right?? lol Thanks for the great recipes. I'm going to have to go try some more of them. Hard to believe, but we sometimes had leftovers! Slightly toasted the next morning (they were quite thin and the size of a dollar bill, and if stacked on top of eachother a lot of the air goes out of the bubbles) with jam -- a perfect breakfast! We used Carnation milk instead of the milk or cream in the recipes. Mmmm I had to make this for my husband...I didn't know how to explain it so I called it Mennonite Bannock and he said I am right, it does resemble bannock the way his family makes it. Oma always made these but left them closed so they would puff up. We'd poke a hole in the top and pour the syrup into it. Oh, I am going to have to make these. I miss Oma. I'm from a mennonite family in Winnipeg. We too ate them with watermelon, but rather than roger's syrup powdered sugar. The puffy soft one's my oma made to dunk into what she called "poor man's soup". So yummy. I'm from a menno family in Winnipeg. My oma served rollkuchen with watermelon as well-not with Roger's syrup, but powdered sugar. I'll try the syrup this summer. My other oma only ever made the puffy rollkuchen and served it with a potato and onion soup she called, "poor man's soup". Thanks for the recipes. I am also from a Menno family from Wpg. Have since moved to Sask. and not to many menno's here. I am making Rollkucken this weekend for some non Menno family and friends. I just hope I don't eat them all before I have to serve them. Watermelon is just not so good around here. lots and lots of mennos here - all over the province. Tons around Saskatoon and just north of the city. I'm told the best Watermelon is found in Warman. I don't know if they buy from a different supplier but I find great tasting ones in Giant Tiger. Also - seeded water melon is always sweeter than seedless, although not as easy to eat. I have made them a few times already so far this summer.And this weekend one HAS to make them as we're having pioneer days here...,and menno food iks a must.Now maybe not to nutritious,but tastes so good for sure!!! Just heard this weekend that my Grandmother used to serve these with a chocolate sauce made with cream, brown sugar and cocoa - anyone ever heard of this? I am wondering what kind of a recipe I would use for this sauce - sounds yummy, although watermelon would still be my favorite. Dorothy, I'm not familiar with eating rollkuchen with chocolate sauce either. If you track down that recipe...let us know! It sounds like dessert and delicous. My mother used to make these all the time but we called them "hrusti" in Ukrainian. She would sprinkle them with icing sugar. I the interest of calories/healthy/etc, would it be okay to sub the cream with milk. I know it won't be as rich but will they be okay? If you're looking to eat healthily, eating fried dough might not be the way to go... I don't know if just subbing milk would make a whole lot of different in the whole scheme of things! In the 60's, when Grandma lived, she would make a trailer load of roll-kuchen. Grandpa called the watermelon are-BOOS, roll the r in are. I liked mine with both melon, and honey....never got to try the rogers, but the honey was mighty fine. I am so happy I found this recipe! My grandmother makes this but without cutting the slits in them so they puff up. They're my father's favourite and I definitely one of mine. Can't wait to try it out and many of the other Mennonite recipes on here to get back to my roots! Does anyone know of a recipe for these delish roll kuchen made with almond or coconut flour....my granddaughter can't have wheat but can have these flours or buckwheat. Anonymous, there is a gluten-free recipe on our blog ..link is http://www.mennonitegirlscancook.ca/2009/05/my-rollkuchen-gluten-free.html It does not have almond or coconut flour but perhaps these gluten-free flours are OK for your granddaughter. My mother who was born in Russia used to say how her family, when they were still living in Russia, did not eat watermelon and rollkuchen together. Apparently they had the most huge and delicious watermelons to quench their thirst on hot summer days but rollkuchen, as others have alluded to, were always eaten with jam or syrup. 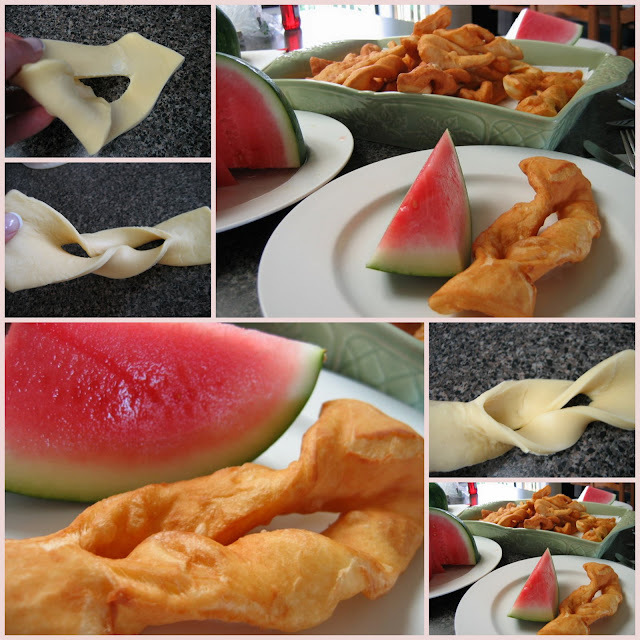 The watermelon-rollkuchen dinner seems to be a North American Mennonite tradition. I need to make these for a wedding in August? Can I make them ahead of time and freeze them? I think your best idea if you are happy with making ahead and freezing them would be to make one batch now and freeze it and then thaw and eat. I have never tried to do this and think that they would not be as fresh tasting. I would probably warm them gently in the oven. All the best and let us know how that works for you. I can vouch for that. Since my Grandmother passed away, my grandpa collects them by the bag full every summer from the little old ladies in his town (haha). He freezes them (cooked and cooled) in zipper bags, and then thaws them out whenever he gets a craving, and liked to warm them up in the microwave or toaster oven, depending on what he feels like. Then he smothers them in jam, whereas I prefer them with the less traditional cinnamon sugar. I agree that they are never as good thawed as when they are fresh; I feel like they tend to feel dry or chewy. But enjoy! I always freeze them but they must be reheated in the oven....come out crisp & delicious as the first time!! I don't use cream....l use my mom's recipe: 1/2 cup melted butter; 1 cup milk; 2 eggs; 1 "good" tsp salt; 1 "good" tsp baking powder....add flour to make a soft dough. Roll out thin; cut into rectangles & twist. Deepfry. to me; these are the best!!! I have made them by cutting them out and twisting and freezing ( raw) on a cookie sheet ( with flour of course) and frying them just before we want them . Not as good as fresh , but better then frozen and reheated . Do you fry them from frozen then or thawed? Mom would make these every year when we would butcher the "old hens" as the egg ducts were full of yolks of all sizes. She called them "pigs ears" and they were dusted with icing sugar. My mom's side of the family is Polish. I want to fry them as close to an event as possible for the fresh taste, so I'm wondering if it would work well to make the dough, roll it out, cut the strips and twist them and everything, them lay them on a sheet with wax or parchment paper between the layers and cover them well then refrigerate for 1 or 2 days then fry at the venue last minute.